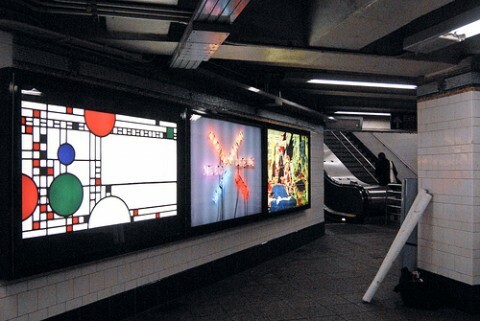 In a gift to the city’s subway riders, MoMA takes over Brooklyn’s Atlantic Avenue/Pacific Street subway station, filling the station with reproductions of over 50 works of art in the MoMA collection. 24 hours a day, 7 days a week, walk through the station to see images of works by Pablo Picasso, Vincent van Gogh, Charles Eames, Cindy Sherman, Andy Warhol, and many other great artists, filmmakers, and designers. It’s a beautiful reminder that the real MoMA is only a short ride away. I checked it out this morning, on a press tour, and what can I say: F-A-N-T-A-S-T-I-C! It was somewhat surreal to admire these famous pieces of art in such a rushed environment. A wonderful clash of an every day life situation where we do not pay attention to our surroundings and just rush from A to B. Make sure to download the Audio Tour before you go and explore. Open 24/7 from february 10, til March 15, 2009. (Why not for forever?) Check out the Gallery for images. Thumbs up MoMA and HappyCorp. MoMA Atlantic/Pacific is brilliant and makes me happy! What a fab idea. Need to check it out. Thanks for the tip. Is it cynical of me to assume the idea is somewhat ‘borrowed’ from D&AD gold award winning ‘Grand Tour’ campaign for the National Gallery in the UK by The Partners? It’s too bad they sacrificed the website’s load time for excessive animation and graphics. To the point where it’s practically useless for a mobile device which is an interesting contradiction when you consider the installation comes with an audio tour which they must have assumed people would use on a mobile device. oh wow, i have to check it out!!! thank you!! about time! this is second nature to the London underground! a great slate for a posterboy or whoever to do their thing. the possibilities for defacing are endless. The above link is a photo of how the space was used before. This is nice too, but I think I prefer the earlier version. @joanna completely agree! should be a permanent and spreading phenomenon – NYCers deserve beauty everyday all day!